My friends and I like to sit around the fire and play some guitar when we are camping or cottaging. So I thought I would put together a list of my top 10 guitar songs when sitting around a campfire.This list is made of songs that I can play and sing. I would love to have listed some Neil Young, but I just haven’t been able to play any of his stuff yet. 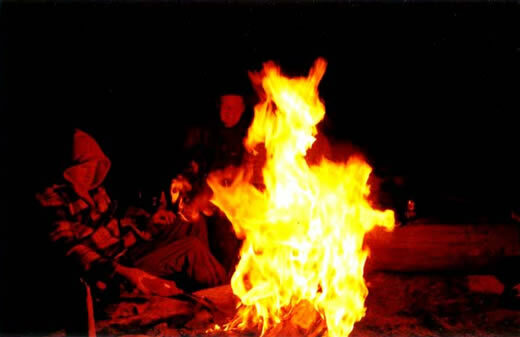 The keys to a good campfire song are that they are engaging. You want your friends to enjoy what they are hearing and participate when they can. That means you should look for songs that everyone knows or has heard of. Simple songs such as the Gambler or Cats in the Cradle will get everyone singing along because they know the lyrics and the tune. BTW I took the above picture after a long night in Algonquin Park involving quite a few Mooseheads. Word of advice, keep your friends away from the lighter fluid! « Beer Snob or Drunk? Test Results!